in a day of education and in-depth discussion on critical topics and enterprise-level best practices in operations and supply chain! 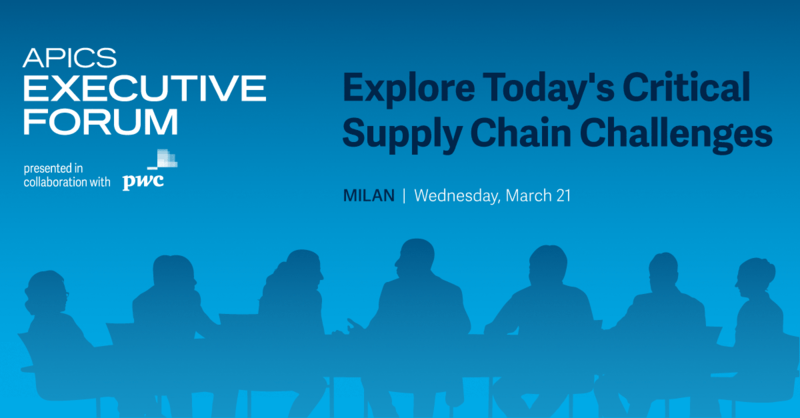 The Executive Forum Europe 2018 was held Wednesday, March 21 in Milan (IT). Michael Ginap spoke on behalf of APICS and facilitated an interactive session engaging thought leaders with participants, sharing practical experience, insights and actionable takeaways on supply chain topics that matter: innovation, consumer/customer driven supply chains, talent, and supply chain risk. Topics were presented by subject matter experts from Baker Hughes (a GE Oil & Gas company), Fiat Chrysler and PwC, followed by roundtable and open forum discussions. If you like to learn more about the content, please leave a comment below. Chatham House Rule applies. Want to be engaged with APICS? Click here.